You never forget your first poutine the saying doesn’t go. But it should. After all, what gastronomic experience could be more profound than the comforts of crispy fries, luscious gravy, and melty cheese curds, followed immediately by sleepiness, the fat sweats, and self-loathing? I can tell you when and where it was I plowed into my first poutine. And, if it wasn’t life-altering exactly – in truth it was very prosaic and transactional – it was certainly an experience that I have not and shall not soon forget. It was August 5th, 2009, at Sebby’s Pub et Grill in the small town of Sherbrooke, Quebec. It was a humid, slightly overcast day, and under a striped yellow, red and green tarpaulin we sat, the backs of our thighs sticking to the plastic chairs, sipping Rickard’s White beer out of plastic cups… Long, wilted fries poked out of a deep soup terrine and squeaky cheese curds nestled in a slick of congealed gravy. It was abundantly clear that no attempt at improving the presentation had been made. For all its virtues, it can be said in complete fairness that Sebby’s is not the kind of place that spends a lot of time worrying about its appearance. And, on reflection, if white beer was appropriate for the conditions, it probably wasn’t really the weather to be eating poutine, but, we hadn’t had breakfast that day, and in any case, we felt compelled to eat it by the behavior of the locals — an adjacent table of black leather-clad Quebecois bikers — being appropriately savage with their poutines, unkempt whiskers a-wash with gravy and flecks of cheese curd. 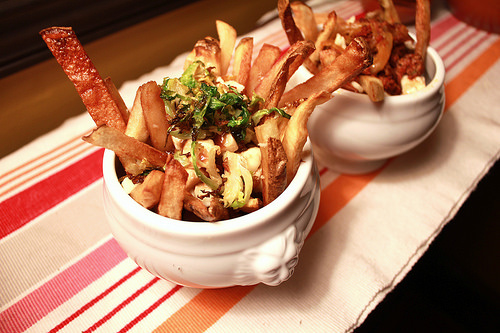 Poutine seems like a meal you’d make while sloppy drunk, or, at best, one that combines whatever is to hand to keep the horrific Quebec cold out, and its origins could lie in either. Allegedly, the name, which in colloquial French means a mess or a stout person, often used derogatorily about women, from the French boudin (originally from the English word pudding – as in “ooh, since the wedding, she’s turned into a bit of a pudding!”), came about when Fernand Lachance of Warwick, Quebec, having been asked to put cheese curds on top of a plate of French fries remarked “ça va faire une maudite poutine” / “that’s going to make a damn mess”. And this was even without the more recent addition of the gravy. I think of poutine in the same celebrated realm as the the famous Eton Mess – a dessert in which broken meringue, strawberries and cream are flung together – as an originally-accidental, now purposeful, amalgam of things that should be better enjoyed separately but which have been made somehow sublime in this combination. That afternoon, as our poutines sank into our waistlines, we drove north towards Quebec City, our destination, through lush and verdant farmland and thickets of maple and oak. Feathery cornstalks alternated with potato-fields that looked as smooth and soft as moleskins as we motored by, until we hit the awful town of Thetford Mines. Rarely have I seen a place so ravaged by the hand of man. Giant craters like acne pockmarks sunk in to the earth between humpy brown hills of slag waste surrounding a battered-looking town of grey concrete and pebble-dash. There was not a blade of shade in the entire town. At a right-hand turn in the center sat a dented blue and chrome casse-croute snack bar, slumpily advertising local specialties, including poutines de notre région. It was the most hopeful-looking building in town, but it was closed on a Saturday afternoon in midsummer. The sole resident of Thetford we saw was sitting on the diner’s steps pulling on the end of a cigarette. He had the same worn-out look as his town – a rutted face speaking of a life spent exposed to the elements and the bowels of the earth. For generations the poorer sibling of Montreal, as Francophone Canada has been to its more prosperous Anglophone counterparts, Quebec City has always been a steward of French-Canadian tradition. Older, craggier, and less affluent, even the French spoken in la belle province is full of seventeenth century colloquialisms. Quebec City is also the possessor of the only extant walled colonial city in the Americas, and has been designated a World Heritage Site by UNESCO. Driving through the city’s outskirts, we saw the stained concrete familiar to neglected public housing the world over, but drawing closer to the historic old city, and with the electro-strains of 1980s French pop hit “Voyage, Voyage” on the radio, a much more optimistic and restored vista came upon us. The massive stone turrets of Quebec’s battlements loomed above sturdy colonial-style houses with bright red roofs out of which dormer windows winked the peachy glints of the low sun as we strolled the old city that evening. The streets all Gallic-scented, a-hum with conversation, cigarette smoke, the tang of local hoppy ales, and the sizzle of frying potatoes. The whole city seemed to be outdoors, beers in hand, sharing poutines at trestle-tables. It seemed a world away from the decrepit squalor of Thetford Mines. Later, seated at an open window at Bistro Les Bossus over a remarkable dinner of confit chicken gizzard salad and veal kidneys in mustard sauce, we reflected on the contrasts we had seen during that mostly unremarkable, but unforgettable day. The gently-rolling countryside, the harshness of man’s hand upon it, the local accent as thick as brown gravy, combining into a concoction as rudimentary yet coherent, unrefined, and distinctly Quebecois as poutine. A recipe isn’t really required for poutine since for making French fries all you need is a knife to slice them and a pan and some oil to fry them in, but it is worth noting that since the gravy for poutine soaks into the fries, the double-frying method illustrated here is recommended so your potatoes are nicely crispy on the outside and can withstand at least some of the soaking. 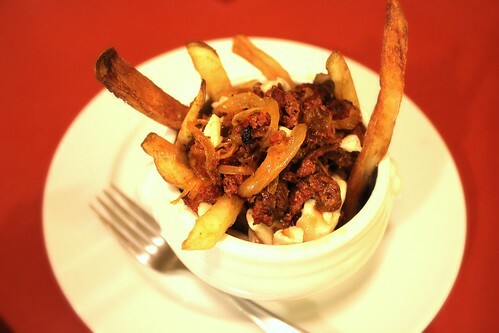 However, from its humble beginnings, poutine now comes in all sorts of varieties, including merguez sausage (as above) to make a “Tunisienne”, with smoked beef brisket to make a Montrealaise, with pickled jalapenos to make a “Mexicana”. Let your taste be your guide. Cheese curds aren’t that readily available south of the border, but you can order them from a number of online sources based in Wisconsin, or, as we recently saw, at Trader Joes as part of a poutine kit that includes ready-cut fries, rehydrateable gravy and a serving of cheese curds. We smuggled ours back from Canada over the summer and secreted them in our freezer. They freeze very well. How I do love it when my Canadian friends wax poetic about their poutine! I don’t get north of the border very much (truth be told, I’ve been north just once, and that was to Calgary for a business trip, so I never experienced the more civilized pleasures of Quebec), so I have yet to create the memory of my first poutine. I am always so curious about those squeaky cheese curds. Maybe I can get to Wisconsin one day at least. In the tri-state area we have the cheap version in any diner – disco fries! Nothing like a 3AM plate of soggy fries, congealed gravy, and melted unidentifiable cheese! @Rachel(S[d]OC): it’s funny how saying a word in French makes the thing itself somehow transcend its ordinariness? 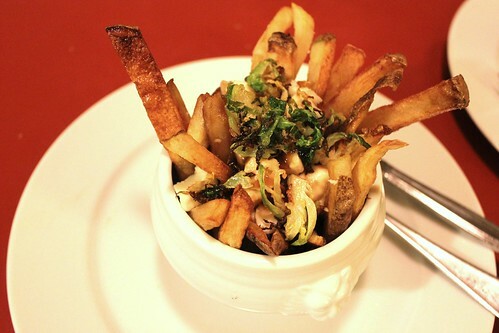 Poutine is different from disco fries, but really not that much. Maybe the kind and color of cheese is the key difference. Then again, the same beer you drink at home tastes completely different drunk on a beach in the Caribbean. @Deana: I don’t think you can go far wrong making foie gras anything. Martin Picard at Au Pied de Cochon serves a foie gras poutine that I understand has stopped many in their tracks, quite literally. We brought back an entire foie gras from Canada that I hope froze well, because we may have to defrost it before the end of this infernal winter and add some more lipids to our blood stream. And, yes, you can mail order cheese curds from Wisconsin! I made the foie gras poutine for my first stab at the dish because it sounded so absurdly good I had to try it. I did not have the proper cheese (I combined mozzarella and fresh cheese) but would love to try it now that you have shared a resource for it… and it freezes! I thought it was delicious with homemade gravy.